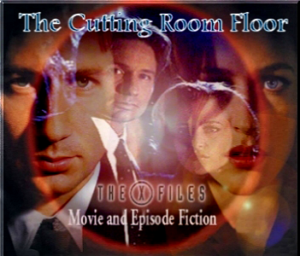 The Cutting Room Floor, originally managed by Pete Scully, was one of the largest X-Files movie/episode based fanfic archives during the original run. It started as an archive for ‘Flickfic’ (Fight the Future stories) and quickly expanded to include other seasons. Stage one of the resurrection is finally complete. Archive.org, the massive trailer from whereunder we exhume long-buried archives, is rather hit and miss in what’s available for a particular site. There were over 500 stories that had to be replaced, over 4000 links that needed fixing, as well as a number of missing banner images. Fortunately the banners were easy enough to recreate, but there were background images in the tables on the index page that could not be recovered. Stage two of the resurrection involves adding all the extra stories that should have been there but weren’t linked on the pages we had. In the meantime, if you’re looking for a specific post ep fic that’s not there, feel free to ask. Click the above image to visit the archive, or go to crf.xhumingpotatoes.com.